This is possibly the only rental property available in Palmetto Dunes that is a 10 minute walk (5 minute bike ride or drive) to the beautiful 3 mile Palmetto Dunes beach AND is on a lagoon with a private dock AND has a view of the 2nd hole of the Fazio golf course! We are situated at the end of a quiet cul-de-sac on a no-through traffic street at 34 Heath Drive. From the moment you step into the vaulted entry way, you'll be drawn to our open, flowing main floor and will find one pleasant surprise after another. The elegantly appointed formal dining and living rooms offer additional living space not common to many vacation homes. You'll be drawn to the spacious family room with incredible views of your deck, patio, pool & spa. This isn't a typical vacation house...it feels like your home-away-from-home during your stay. From the family room, you'll find a fully equipped kitchen with breakfast bar and informal dining area. Vaulted ceilings and open floor plan give you and your guests room to spread out. Every view is spectacular! This section of Palmetto Dunes features large lots with excellent separation from your neighbors. Our lovely lagoon is home to gators, turtles, heron, egrets, woodpeckers, owls & wood storks. If you look closely and a patient, you'll have a great view of a Heron nest in the tall pines directly across the lagoon from our house. Unlike most rental properties, you also have use of our garage with keyless touchpad entry. Our home is located within the security gate of Palmetto Dunes resort. The Inverness Neighborhood of Palmetto Dunes is surrounded by the 11 mile lagoon system and situated away from the busy streets in other Palmetto Dunes neighborhoods. Heath Drive is very quiet (no thru traffic) street and we are located on a cul-de-sac which allows further privacy. Our lovely vacation home offers guests three king master bedroom suites and one queen bedroom, each with a private bath and large closet space. The bedrooms are well-seperated for privacy We also provide a full size and a twin size air bed for children. The maximum ADULT occupancy is 8. The twin fits in an alcove in the master closet with lots of room to spare! Our grandchildren love to 'camp out' there. The master suite features French doors to a private deck & a large master bath with a jetted corner tub and oversize shower with spectacular views. There is also one queen guest bedroom on the first floor. As you can see in our photos this home (3200 square feet) is beautifully furnished & professionally decorated. Our master suites have been redecorated and feature new king mattresses. Master bathrooms both have double sinks. PLEASE NOTE: maximum of 8 adults. We spend winters here and take great care to do deep cleaning of carpets and bedding. We want your family, friends and guests to have an excellent experience and are quick to address any concerns you have during your stay. We provide our guests with tons of Hilton Head and Low Country information and are happy to suggest our favorite things to do. We welcome families & children to our home! During your stay, please enjoy our full size pool with many toys for the children. When you can tear your family away from the pool, head to the beach! Pack our tote with our umbrella,beach chairs, sand toys and boogie boards and head off to the beach. If you are up to cooking, we have a gas grille, picnic supplies and room the whole family for dinner by the pool. Bathing suits allowed! We aere well equiped for you younger guests, and supply two pack 'n plays (your sheets), a high chair & an umbrella stroller a full size Peg Perego stroller. Fishing from our private dock is permitted. We provide family games, cards & a poker set as well as DVD, CD & VCR players. For adults, the dry bar in the living room contains a full compliment of glasses, shakers & barware. Kayak, canoe & bike rentals are nearby at Palmetto Dunes Outfitters where you can launch into the 11 mile lagoon system that offers a unique view of the Dunes as it wanders through the homes & golf courses of the resort. Kayaks cannot be launched from our private dock on the lagoon) The fitness center in the nearby Marriott Ocean Front Resort offers weekly access at reasonable rates. Beach access is conveniently located through the Disney Beach Resort or the Dunes House in Palmetto Dunes where you'll find bike racks, limited parking, decks, restrooms & a snack bar. Relax at the Omni Beachfront Resort which offers full spa services at the Ocean Tides Spa just minutes from your front door. The Coastal Discovery museum and Pinckney Island (National Wildlife Refuge) are great places to explore. Palmetto Dunes amenities are among the finest on Hilton Head Island. This property is conveniently located to all of them! Enjoy 3 miles of spotless beach, or choose from a world class tennis facility and three championship golf courses. Unique to Palmetto Dunes also is an 11 mile lagoon system. Shelter Cove is Palmetto Dunes' deepwater access. Boat & kayak trips on Broad Creek and to many destinations depart from here. There is great shopping, scenic views of the harbour, shopping & restaurants. Summers offer outdoor family entertainment & fireworks on Tuesdays. Take the complimentary Dunes Buggy and avoid looking for a parking place. Renovations and improvements are nearing completion at the Mall at Shelter Cove. The addition of a beautiful Kroegers and Whole Foods Market, as well as many shops & restaurants, have made the Mall a great place to shop, eat and enjoy the beautiful walking paths that border Broad Creek. We are golfers and have played most courses on & near the Island. We are happy to suggest our favorites. Palmetto Dunes often offers complimentary golf & tennis clinics, too. We know you'll love Hilton Head Island and hope you'll visit soon! Please call the owners direct at first number listed below (cell phone) for further information. 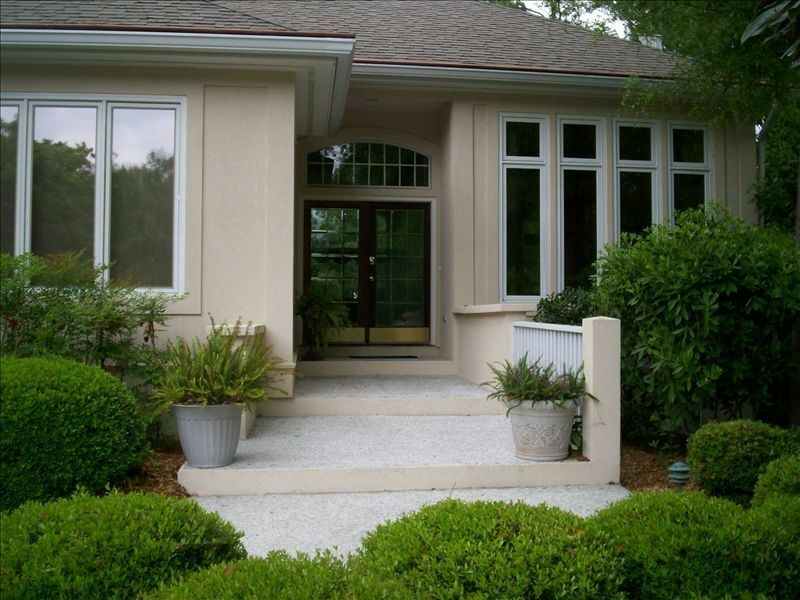 We look forward to having you and your family & friends enjoy our wonderful Hilton Head Island vacation home. PURA VIDA! Since our family has been vacationing on HHI since 1982, it was finally time to take the leap into vacation home ownership. We enjoy all the wonderful amenities offered by the Low Country, HHI & Palmetto Dunes and look forward to sharing our little piece of heaven on earth with you and your family & guests. Wayne & Judy live in Pennsylvania and work at Sugarloaf Golf Club. Wayne is an avid cyclist and runner and this year logged over 170,000 miles on his bike and 17,000 running (lifetime). Wayne is beginning his first year in semi-retirement. In addition to her duties at the golf course, Judy has her Real Estate license, loves to cook and is an avid winemaker. Their son Patrick and his wife Michelle are continuing the family tradition of vacationing on Hilton Head Island. Together, Wayne & Judy's greatest joy is spending time with their two grandchildren Evan & Gracie. who also love to visit the beach house. Linda & Mike are from West Virginia (Wayne & Linda are sister & brother ~ Judy & Mike call themselves 'the outlaws' instead of the in-laws). Mike is a retired mining engineer & Linda is a tax preparer. Mike is an avid hunter and Linda is the decorator of the family. They spend most of their free time with their two children Christine & Michelle and seven grandchildren Aly, Bailey, Josie, Taygen, Kayla, Eric & Andrew. They recently were blessed with their first great granddaughter. Together with Wayne & Linda's parents and our family friends, we have enjoyed many years vacationing here and have been blessed with so many wonderful memories of Hilton Head. When we walked in the front door of this house for the first time, we were all speechless. The open floor plan, beautiful decor and gorgeous pool area were icing on the cake. This house was more than we ever thought we'd find under one roof. toilet, shower, jetted tub, Double Sinks and vanity area. All bedrooms feature private bath. There is a shower near the pool area. .2 miles to Palmetto Dunes pristine 3 mile oceanfront beach. We are located within the south security gate of Palmetto Dunes Oceanfront Golf & Tennis Resort. Our large lot offers a private full size pool with spa, private dock on lagoon and a view of the George Fazio Golf course. Central air with two heating/cooling zones. Sheets for pac 'n play & air beds are not provided. 1st floor laundry room. Please do not leave the house with the washer or dryer running. 2 car with keyless touch pad entry. Beach towels are not provided and house towels may not be used at the beach. Vaulted ceilings, gas fireplace, dry bar. With automatic ice maker and water dispenser on door. Extra refrigerator in the garage. We keep two large tubs of pantry items at the house (flour, sugar, oatmeal, popcorn, teabags, coffee filters, etc). You are welcome to use them during your stay. Please feel free to use our spices & herbs! We also have fresh potted herbs outside. Formal Dining Room and breakfast room seat 12 plus 3 bar stools. All flat screen TVs. Family Room Smart TV. Cable TV with Wireless internet. Pool toys and beach toys available. Deck & patio. Family room leads to deck, then pool area with 4 lounge chairs and three eating areas. Private dock on lagoon. Private deck from 1st floor master bedroom. Our first floor is fairly handicap accessible. My sister is handicapped and depends on her wheelchair. It is not an electric chair. She uses the first floor master bedroom and bath which has a shower. We put an outdoor chair in the shower. A medical shower bench would fit, too. There is a grab bar in the toilet area, but it is a small 'room' that would not fit a wheel chair. The rest of the first floor is accessible and open. A few minor furniture re-arrangements would allow complete accessibility. There are three steps into the house from either the front door or the garage. All in all, my sister gets around the house with the assistance of her husband. Please note: there is not a handicap ramp entrance. Once inside, the first floor is accessible. Very private setting. Gas Grill, seating for 10+ outdoors. Picnicware provided. With waterfall into pool. Privacy hedge. Luxuriously furnished. Hair dryers provided in each bathroom. One queen-size & one twin-size inflatable beds available (bring your own sheets). High Chair provided. Peg Perego stroller provided. Pac 'n play provided (bring your own sheets). Private dock on Lagoon. Asstd beach chairs, umbrella and beach & pool toys provided. My family and I spent spring break week at Pura Vida and had a very enjoyable time. Loved the views!!! Wish we were able to stay for one more week to enjoy warmer weather and the pool. We did take advantage and the well stocked kitchen (lots of great seasonings AND coffee) and the grill. Nice home for a large family to spread out and relax. Booking and communication were easy breezy as well. I would recommend for sure! Nice location but many things wrong. One of the main reasons I choose this house was because of the nice dock on the lagoon. One of our men really like to fish and he was extremely disappointed to find that there were no fish in this part of the water. If I had known this I would have looked elsewhere. There were many lightbulbs out in the House. I would think that checking and replacing bulbs would be done before residents check in. Both top electric outlets in small downstairs bedroom did not work. The main net for the pool was ripped and you could not clean all the debris out of the pool. The water pressure in the house was a problem. If 2 or more were showering at the same time then you would have fluctuations in the water temperature and I actually had the water completely stop one time. And lastly, the refrigerator is in the most precarious location. If you open the door there is no room to walk by other than going around the other direction. We were in Hilton Head for a destination wedding (my youngest son) so I rented the place for a family place where we could all gather together. We all loved it and my kids thanked me repeatedly for finding such an outstanding house. So much better than staying in a hotel. Everything was just as represented and the response and service from Judy was outstanding. I wish I was still there. You can't go wrong with this place. We enjoyed our stay. House has a great set up with bathrooms in each bedroom. The amenities (beach stuff, games, hottub) were handy. Judy provided great info for the “to do’s” in the area and tips for getting around. Would definitely stay again and recommend. Beautiful home located in a cul-de-sac in a quiet neighborhood, just a 5-10 min walk from the beach. Judy was very easy to work with. Would definitely recommend. Perfect spots for our golf foursome. Location is near lots of golf courses and eateries. The house is wonderful with 4 Br/4 baths so everyone is taken care of. Nice TV room with view of lagoon in the back yard. Pool and hot tub helped relax at the end of the day. Would do again in a heartbeat!! Palmetto Dunes offers the perfect golf, tennis and/or family escape! Rated #1 for Family Vacations by Travel & Leisure Magazine. Check website for complimentary golf & tennis clinics. 3 miles of pristine beach, 11 mile lagoon system for canoeing & kayaking plus miles of bike paths. Bring your beach towels! Complimentary 'Dunes Buggy' for transportation throughout resort. Tuesday fireworks & live entertainment in Shelter Cove. Live beach entertainment at nearby Shorehouse at the Omni Hotel Beachfront Resort. Beach access for Palmetto Dunes guests with snacks, deck & restrooms (parking available) or at the Dunes House beachfront casual bar/restaurant. Our preferred payment method is by check. PayPal is available; however, please note that PayPal fee of 2.9% will be added to your invoice.